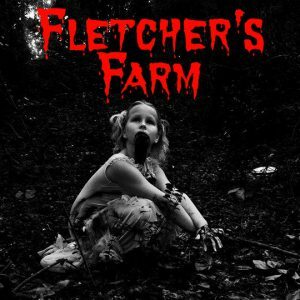 Fletchers Farm is a Haunted Attraction located in Hartsville, SC. Team Jefferson Starship reviewed this attraction on September 30, 2016. Fletcher’s Farm has grown over the past nine years to become a very strong Haunt in rural South Carolina. Stretching over and across a rural farm, the Fletcher’s haunt is guaranteed to be an evening of entertainment. Fletcher’s has a volunteer cast of around 50 individuals. Out on the trail and in the ‘house,’ the actors seem to be well-positioned and do a good job of staying in-character to deliver scares. There were a few instances of actors coming out to the waiting area and removing their masks to take a break, which does break immersion. When actors used dialogue, it tended to be believable and appropriate for the character. The majority of the actors were enthusiastic (and even helpful when we wandered off the beaten path!). The ‘flower girls’ in one scene were very interactive, creepy, and believable as spectral, grave-side welcomers and demented flower-sellers. Dim lighting helps hide costuming errors; but, with an all-volunteer staff, good costumes can sometimes be hard to come by. Fletcher’s Farm does feature a lot of masks to hide the identities of the creepy folks who are scaring unwary visitors. There were some notable actors with believable make-up scattered throughout the haunt as well. There were one or two cases where a costumed spook didn’t belong in a given setting, but those were exceptions and not the rule. Be prepared when you visit the Farm! Close-toed shoes are recommended by the site and we concur. You’ll be wandering dimly-lit forest paths, ducking under low ceilings, squeezing through narrow passages, climbing small ramps and, sometimes, navigating uneven floors. There are staff members in the waiting area and, occasionally, along the outdoor trail (flashlights can help you find your way in the dark). Staff are friendly and approachable, but sometimes blend in with other customers. There’s not really a lot of signage to direct you out to Fletcher’s Farm; consider it a hidden gem. The driveway, however, is well-lit and, given the isolated location, will be apparent as a destination. The huge, outdoor waiting area not only has a concession stand and multiple fire pits, but also a dancing skeleton providing some entertainment value (Link to Instagram Image). The music selection isn’t exactly Halloween related, but where else do you get to watch a dancing skeleton while waiting to ride off across deserted fields? When you park in the huge field, you can hear the pop music blasting from the Skeleton’s Perch out over the fields. After getting your tickets and moving into the wedding area, there’s a definite 1800’s vibe going on with a huge façade. It seemed like a huge barn party and there’s plenty of time to meet people and talk before you get called back to the hayride. The waiting area could have used some scares, but you could occasionally hear screams and shouts of surprise from the area behind the façade. If there’s one word for the effects at Fletcher’s Farm, that word would be ‘loud.’ From air horns to chainsaws, there’s lots to make you jump… sometimes in places where you least expect it. Some of the scene spreads that you move through along the trail are very well done. The Fletcher’s team has done some creative set building for their visitors to get lost in. Be on the lookout for a laser effect, the vertical, black-lit sticks, and an amazing ending. Some areas of the trail did have poor lighting. There are large, blank spaces that separate each scene that could have used some more attention, but served to allow a visitor to approach each area fresh and ready for a new scare. If anything, the scenes were too small because we often wanted more and more. Fletcher’s doesn’t have a single theme. There are lots of jump scares in Fletcher’s Farm… some of them quite predictable. However, you can move through the haunt at your own pace once you start. One group that went through before us got so turned around and lost that we wound up passing them on a couple of occasions! The haunt itself presents different types of scares across its entirety, but most of them are not based on actor interaction. While there is a bit of a wait after you get your ticket, once you are off the trailer and starting the haunt, you can move through at your own pace. We spent about 45 minutes walking the length of Fletcher’s Farm. Given that tickets are only $11, that comes out to 4 minutes of haunt per dollar. Despite the scares, take the time to enjoy the scenes and get lost in the work that’s been done out on the Farm. We would have liked to have had some scares on the hayride out to the start of the trail back, more things along the trail itself, or even just longer scenes, but many of the scenes at Fletcher’s are well done and worth the wait to see.